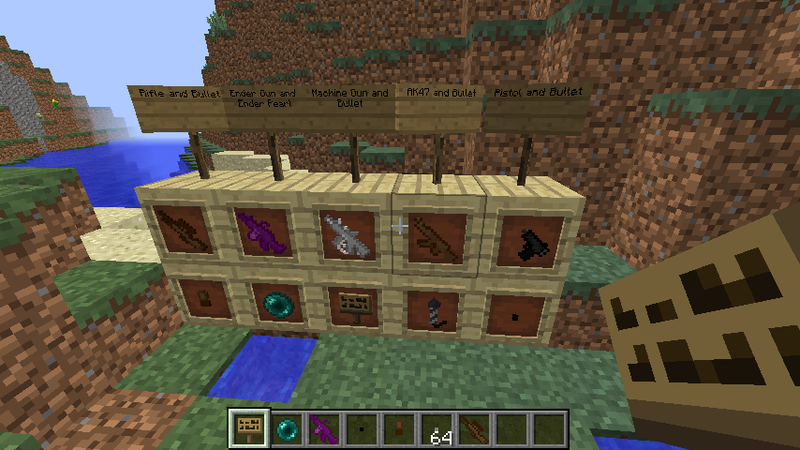 This mod adds five new guns to your minecraft world. The first gun the Rifle uses rifle bullets for ammo, does five damage, has bullet count of 75, and has a bullet power of 3. The second gun is the Ender Gun which uses ender pearls for its ammo, does 3 damage, 2 knockback, has a bullet count of 75, has a bullet power of 1.3 and teleprots you a short distance when hit by the bullet. The third gun is the Machine Gun, this gun uses the machien gun bullet, it has a bullet count of 115, does 3 damage, has a bulet power of 2 and does constant shooting. The fourth gun is the AK47, this gun use the AK47 bullet, it has a bullet count of 60, does 3 damage and has a bullet power of 1.3. The last gun is the Pistol, the gun uses a pistol bullet, the gun has a bullet count of 40, has a bullet power of 1 and does 2 damage. Any questions of mod or crafting recipes i'll respond to. If anyone would like to showcase this mod please feel free to do so. if i had a youtube channel i would so showcase this mod.